Ramping up wind power in America could also dial up the nation’s temperatures in the neighborhood of the wind farms, a new study out of Harvard found. While wind energy is widely celebrated as environmentally friendly, the researchers concluded that a dramatic, all-out expansion in the number of turbines could warm the country even more than climate change from burning coal and other fossil fuels, because of the way the spinning blades disturb the layers of warm and cold air in the atmosphere. Some parts of the central United States are already seeing nights that are up to 2 degrees Fahrenheit (1.1 degrees Celsius) warmer because of nearby wind farms, said study lead author Lee Miller, an environmental scientist at Harvard. The researchers and other scientists stressed that climate change from greenhouse gas emissions is clearly a far bigger threat globally and over the long term than turbine-caused warming, which is temporary and stops when the blades aren’t turning. 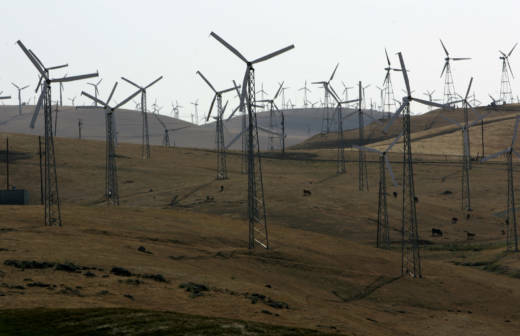 Despite the potential drawbacks, wind energy still makes more sense for the environment than fossil fuels, Keith said. It’s just that advocates of wind power have been ignoring growing evidence of a downside, he said. Overall, the Harvard study, published Thursday in the journal Joule , found that in the unlikely event that the U.S. switched massively to wind to supply nearly all of its electricity, there would be so many turbines that on average the nation’s temperature would go up about 0.4 degrees (0.2 Celsius). Some central areas would see localized warming around 2.5 degrees (1.4 Celsius), though there would also be some cooling in places, such as the East Coast. Right now, wind provides 6.3 percent of the nation’s electricity, according to the American Wind Energy Association. The study, which looked at just the United States, said that the turbines would cause more warming in the short term this century than the carbon dioxide America spews into the atmosphere would. The reason for this effect : Normally the air is more still at night, with cold air staying near the surface and warmer air resting a little higher. But turbines bring the warm air down and cool air up, making the ground a bit toastier. The effect is seen less during the day but is still there. Still, the effect from turbines is different from human-caused climate change. It mostly consists of warming, it’s local, and it’s temporary. When the turbines are still because the air is calm, there’s no warming. Climate change, in contrast, is a global effect that involves many more elements than temperature, such as sea level rise, extreme weather, melting glaciers and shifts in the jet stream. Even if a country stopped emitting greenhouse gases, it would still experience climate change if the rest of the world kept on polluting. Past studies have observed a temporary nighttime warming of as much as 2 degrees (1.1 Celsius) in places with lots of wind turbines, such as North Texas. The Harvard study took observations and used computer simulation to project what a dramatic increase in turbines would look like for temperatures. Other technologies considered environmentally friendly have their downsides, too. Nuclear energy has no carbon dioxide emissions, but there are concerns about waste, safety and cost. The ethanol boom has wiped out habitats, led farmers to plow over prairies, caused water pollution and raised food prices. Wind advocates emphasized that the Harvard study doesn’t show turbines causing global warming, just local heating. “If the paper instead looked across the global and long-lasting timescales that matter, renewable resources would fare hundreds of times if not infinitely better than fossil resources,” Michael Goggin, vice president of Grid Strategies and a former researcher for a wind energy group, said in a statement. Ken Caldeira, a climate scientist at the Carnegie Institution for Science who wasn’t part of the research, said the study is sound.